All about fishing for rainbow, brook, brown and lake trout in New York lakes and streams. There is plenty of trout water in New York to keep any angler happy. Most streams, rivers and creeks have trout and the Adirondack area has miles of excellent waters. Major lakes in NY with healthy populations of trout include Allegheny Reservoir, Ashokan Reservoir, Canandaigua Lake, Cannonsville Reservoir, Cayuga Lake, Cranberry Lake, Great Sacandaga Lake, Indian Lake, Keuka Lake, Lake Champlain, Lake George, Lows Lake, Otsego Lake, Owasco Lake, Pepacton Reservoir, Piseco Lake, Raquette Lake, Seneca Lake, Schroon Lake, Skaneateles Lake, Tupper Lake and Upper Saranac Lake. Click here to find information about trout stocking in New York. Watch trout fishing videos to see trout anglers in action. The 5 primary trouts are the rainbow, brook, brown, cutthroat and lake trout. Browns are considered the most difficult to catch and brookies are the easiest. Pure cold water is key to survival of the trouts. The New York state record brook trout came from the Ha-De-Ron-Dah Wilderness Area. The NY state record brown trout and rainbow were caught from Lake Ontario. Lake Erie produced the state record lake trout. 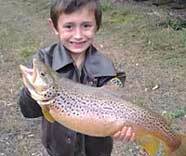 Trout fishing waters and information, by state. Trout are considered some of the most difficult fish to fool. Once you locate New York waters with a population of trout, the challenge becomes identifying trout flies and lures that will trigger strikes. Visit the trout fishing page to learn more about the habitat each of the trouts prefer. Best trout fishing in New York!